Matt Mullins has had a very big year. As the co-owner of Victorian pub group Sand Hill Road, he's no stranger to the publicity surrounding a new pub launch. Sand Hill Road have owned and operated eight iconic Melbourne pubs since 1999, including the Prahran Hotel and the Bridge Hotel. In July, they opened Garden State Hotel, which is their biggest pub yet. And the amazing reviews are already rolling in. Last year, we were lucky enough to have Matt speak at our live hospitality event. The Garden State Hotel was still under construction during his appearance, and Matt shared some fantastic insights about the thought that went into designing the pub. The group’s key focus was to create a venue where patrons would want to spend time with their family and friends. Considering the crowds they’ve drawn in so far, we’d say they’ve succeeded! "Our market doesn't want vast open spaces," Matt told our crowd. "They want intimacy, warmth; they want to be cradled by venues like ours. And that's had a big impact on the way we design our venues." Garden State Hotel has the capacity to fit 840 people over its four (count 'em, four!) levels, but each level serves a different purpose. The basement is home to a sophisticated cocktail saloon, while the ground floor houses a popular public bar. Up on the first level, you will find an intimate dining room, and on the top floor, a beautiful private function space. 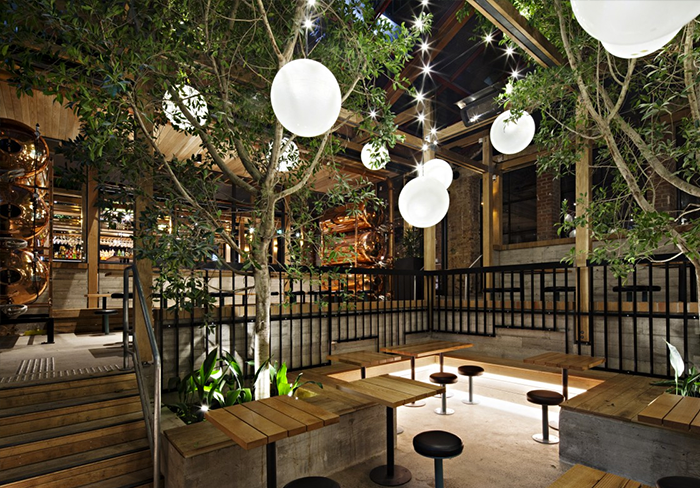 A multi-level beer garden stretches all the way from the basement to the first floor, turning the venue into a hidden sanctuary in the middle of the city. "Our pocket of the CBD is seriously short of gardens," Matt explained to The Shout in a recent interview. "We wanted to provide a lush oasis for busy city workers and residents surrounded by the vast concrete jungle." One thing Matt stressed in his Typsy talk was the importance of designing a venue around your back of house – something many venues don't even think about. "You just can't design a venue without thinking about operations,” he said. “Because you can't run it without operations." That's why they were sure to include elements like staff-only lift shafts, hidden staff-only bathrooms, and something known as 'the skywalk' (watch the video to hear the hilarious story behind that one). The focus of Typsy Live in 2016 is innovation. While Matt won’t be appearing as a speaker this year, there’s no doubt that he and his cohorts are innovators in our industry; always adapting their thinking to keep their customers in mind. And we can’t wait to see what they come up with next. For more motivational hospitality stories, come along to Typsy Live in Sydney on October 5th. Early bird tickets are on sale now!